Renowned detective Hercule Poirot (Kenneth Branagh) attempts to solve what would become one of the most infamous crimes in history. 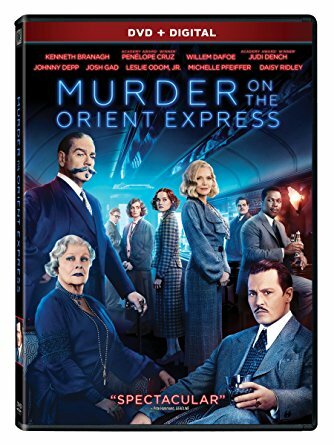 After a shocking murder of a wealthy businessman on the lavish European train, private detective Poirot must use every tool of his trade to uncover which of the train’s eclectic passengers is the killer, before he or she strikes again. Read the book many, many years ago and knew there was an older film adaption but I've never seen that one. This movie was epic though! Kenneth Branagh, amazing! He is the perfect cheeky intellect that we know as Hercules Poirot. The other wonderful collection of cast members helped make this story come alive. Loved the set design too. The hubby and I both had a couple of 'Oh, wow!' moments while watching. Some of the scenes were really beautiful. Even if you haven't read the book, or seen the older film, see this one. My hubby was oblivious to reading Agatha Christie's book, but still loved this movie. This is really a great whodunit. Watch it, I promise you will love it too! **Compensation may be earned from the links within. A screener was provided to facilitate a review. Opinions are owned by Freda's Voice.